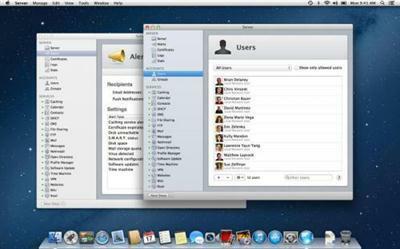 Mac OS X Mountain Lion Server v2.2.2 | Free eBooks Download - EBOOKEE! Posted on 2013-09-25, by kashif0343. OS X Server is the next generation of Apple's award winning server software. Designed for OS X and iOS devices, OS X Server makes it easy to share files, schedule meetings, synchronize contacts, host your own website, publish wikis, configure Macs, iPhones and iPads, remotely access your network, and more. Server is now an application you can add to Mountain Lion right from the Mac App Store. Anyone can quickly and easily turn a Mac running Mountain Lion into a server that's perfect for home offices, businesses, schools, and hobbyists alike. Some features require an Apple ID and/or compatible Internet access; additional fees and terms apply. Some features are not available in all countries. * Caching Server to speed up of software distributed by Apple through the Mac App Store. * Time Machine service monitoring of which computers have backed up, when they last backed up and size of backup. * Wiki Server support for MacBook Pro with Retina displays. * Fix for deleting apps to Profile Manager. * Ability to use Active Directory groups within Profile Manager. * Centralized Certificate management interface. * Fix for administering Profile Manager from iPad mini. * Support for using bonded or virtual network interfaces in Server. * Fix for setup failures due to an SSL error. * Fixes for upgrading from Lion Server. No comments for "Mac OS X Mountain Lion Server v2.2.2".